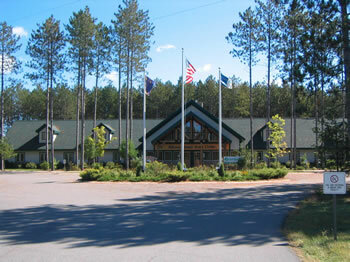 Welcome to the Wausau Homes Scout Center, the nation's first combined facility for the Boy Scouts and Girl Scouts. This facility was made possible by the generous donation of Marv and Ruth Schuette on behalf of the employees and builders of Wausau Homes. The council service center provides resources and information to the Scout family of chartered partners and their leaders. Services include: volunteer training, badges of rank and advancement records, processing of registration, reservations for use of our great camping facilities and programs, and personal leadership from a trained staff. Scouting merchandise, resources and supplies are available through the Scout Shop. The Scout Center is closed for New Year's Day, Martin Luther King Jr. Day, Presidents' Day, Good Friday, Memorial Day, Independence Day, Labor Day, Thanksgiving, the day after Thanksgiving, Christmas Eve, and Christmas Day. The Samoset Scout Shop is here to serve all your needs in uniforms, BSA national supply items, advancement purchases, publications, outdoor equipment, crafts and more. Many of the items listed in the BSA Catalog are in stock and what isn't can be ordered through the Scout Shop, free of shipping charges for you. From the South: Take I39/Hwy 51 North to the Hwy 29 East (Green Bay) exit. Follow Hwy 29 East to the Camp Phillips Road/County Hwy X exit. Take a left at the top of the exit and proceed North on Camp Phillips (County X). Go through three more sets of stop lights (the last set will be at Ross Avenue). Proceed North past Ross Avenue for approximately ¾ of a mile and you will see a sign on the right side of the road for the Wausau Homes Scout Center. From the North: Take I39/Hwy 51 South to the Hwy 29 East (Green Bay) exit. Follow Hwy 29 East to the Camp Phillips Road/County Hwy X exit. Take a left at the top of the exit and proceed North on Camp Phillips (County X). Go through three more sets of stop lights (the last set will be at Ross Avenue). Proceed North past Ross Avenue for approximately ¾ of a mile and you will see a sign on the right side of the road for the Wausau Homes Scout Center.